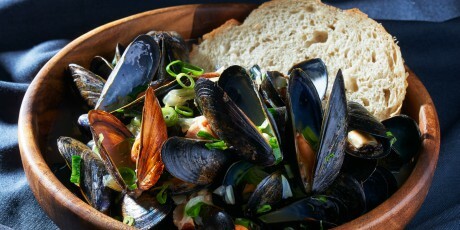 Mussels are the world’s easiest seafood to cook. All you need is a pot and a tight lid. They make their own broth and it just might be more delicious than the mussels. Especially when you start with bacon and finish with beer! 1. Toss the bacon into your largest pot over medium-high heat. Be patient, stirring until every piece is evenly crisped, 5 minutes or so. 2. Stir in the onions as they dissolve the flavourful crust on the bottom. Dramatically add the mussels and crown ceremoniously with your hot sauce rinsed through the shells with freshly opened beer. Give the works a vigorous stir. Cover the pot with a tight-fitting lid. Lower the heat a bit and steam until a rich, tasty broth forms and all the mussel shells pop open, 10 minutes or so. 3. Divide the hot, steaming mussels among bowls (discarding any mussels that didn’t open), pouring in the remaining broth. Sprinkle on the green onions, and serve with lots of crusty bread to soak up the delicious broth and lots of cold beer to keep the conversation flowing!